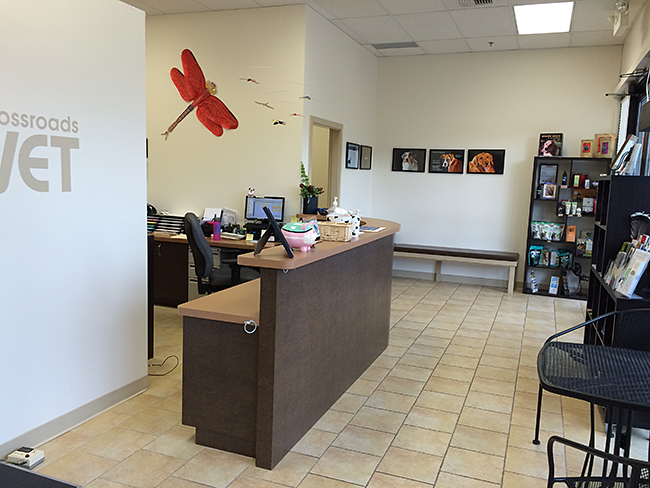 Take a look at our Bellevue veterinary hospital! We have two welcoming exam rooms, and expansive treatment and surgery areas. We love our clean and bright location, located here in the Crossroads Mall. Where else can you drop off your pet, do some great shopping, and have a latte all at the same time? We invite you to take a tour and then contact us with your questions. Better yet, please stop by and see us! Rated 5 of 4.8 based on 79 rated reviews. I cannot imagine taking our boy Alfy to another place. We have been like a family with Crossroads Vet and their fantastic team for nearly four years and just the mention of this place, Alfy starts his happy dance out of excitement to go meet all his super sweet and amazing friends here. They have never failed to put the animal or bird first, more than anything and offer exceptional treatment and advice. We do not hesitate to make the trip to Crossroads Vet even though we moved away from this area! Thank you for the amazing care, love and attention you give the pet and the parents! Visit Crossroads Vet in Bellevue! Your local Animal Hospital that will care and look after your pet family member. Contact us at 425-746-7387 to set up an appointment! We provide veterinary care for your pets, exotic pets, chickens, birds, rabbits and reptiles. Your pet's health is our priority, customer service is our goal. © 1997 - 2019. Crossroads Vet. All Rights Reserved.